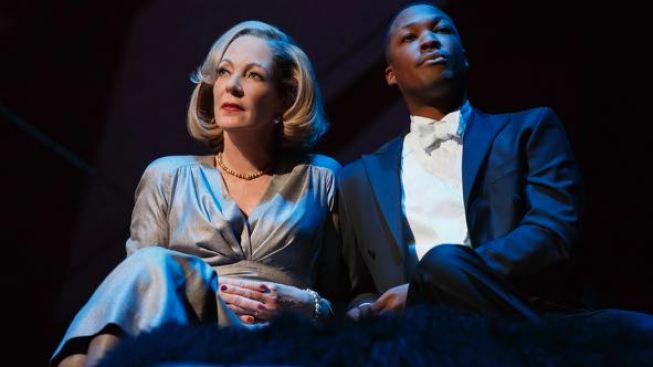 Allison Janney and Corey Hawkins in "Six Degrees of Separation"
John Guare’s "Six Degrees of Separation" has become the first victim of 2017 Tony Awards. The Broadway revival, which went home empty-handed at Sunday's show despite two nominations including best revival of a play, will close at New York's Barrymore Theatre on June 18. At the time of its closing, "Six Degrees of Separation" — which was originally scheduled to be a 15-week limited run — will have played 21 previews and 63 regular performances. A dark comedy about a con artist who convinces an erudite Upper East Side couple that he’s the son of Sidney Poitier, "Six Degrees of Separation" originally opened on Broadway in 1990 in a production starring Stockard Channing — receiving nominations for both the Tony Award for best play and 1991's Pulitzer Prize for Drama. Channing reprised her role in the 1993 film adaptation, which also starred Donald Sutherland and a then-newcomer Will Smith. For this revival (it's first), seven-time Emmy winner Allison Janney, Tony winner John Benjamin Hickey and "24 Legacy" star Corey Hawkins — who was Tony-nominated for his role in the show — led the cast. Direction came from Trip Cullman. Ticketholders who purchased tickets after June 18 should contact their point of purchase for refunds or exchanges.